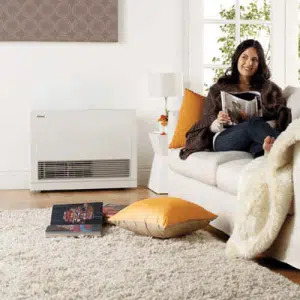 Space heaters and wall furnaces are the ideal choice for heating enclosed spaces such as rooms in homes and offices. There are many options to choose from. Pick a stylish design that complements the aesthetic of the décor or go for something more modern and utilitarian. Space heater and wall furnace installations must be flued. All combustion gases that pass through the heat exchanger are extracted via a fan and then expelled via the flue to ensure that your installation is compliant. We recommend natural gas space heaters because they produce the lowest amount of carbon emissions compared to other space heating options. Are you concerned about flue leaks and the risk of carbon monoxide poisoning? Call Advance Heating and Cooling to organise an urgent inspection.